Thus spoke Warrior-Prince Arjuna, on the verge of a great and terrible battle against his own kin in order to defend his older brother’s claim to the ancient throne of the Kurus. 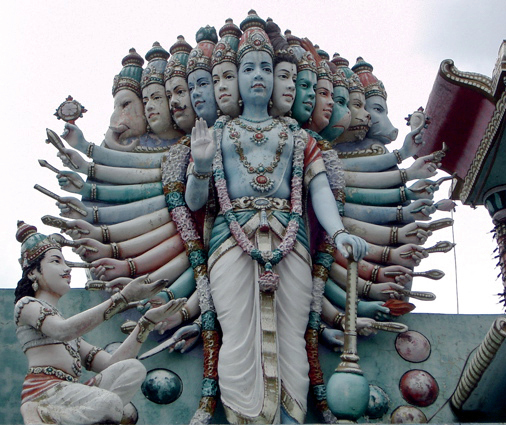 This is the context of the Bhagavad Gita, “The Song of the Bhagavan,” a central Hindu text and one of the most popular and accessible of all Hindu scriptures. Hesitant to shed blood, Arjuna turns to his charioteer, who is actually the god Krishna. Their philosophical discussion is the content of the Bhagavad Gita- a discussion that explores selflessness, devotion, duty, meditation, and other threads of Hindu philosophy. But the Gita is not just a dialogue between two mythical figures before the start of a great war, it’s true subject is the war within: the struggle for self-mastery that every human being must wage. The war within is not a battle against the Self, but rather a battle against that which causes sorrow: attachment, likes and dislikes, and the ego. Victory comes through realization of the self, detachment from pleasure and pain, wisdom in action, and mastery of the senses. Realization of the Self. The Self is the spirit energy that exists within all things. “It is everlasting and infinite, standing on the motionless foundations of eternity” (2:24). As the cycle of life and death continues, the Self continues on unchanged. Death is inevitable for the living, and birth is inevitable for the dead. This is unavoidable, and should not cause sorrow. The Gita describes the Self using the image of a chariot as a metaphor. The chariot itself is the body (sarira). The passenger who rides in the chariot is the individual soul (jivi). The person who is driving the chariot is the Self (atma). The horses are the five senses (indriyas), the reins on the horses represent the mind (manas), and the road along which the chariot is driven are the objects of senses. The body, soul, mind, Self, and senses work together to guide the chariot through life.Detachment from pleasure and pain. When the senses contact sense objects, a person experiences cold or heat, pleasure and pain. Krishna advises Arjuna to bear them patiently because they are fleeting; they come and go. Those who are unaffected by these changes are truly wise (2:14). Placing this in the context of the chariot metaphor, one must take hold of the reins (the mind) in order to properly command and control the horses (the senses) in order to guide them along the path of life. Wisdom in action. You have the right to work, but not the fruits of that work. Never engage in action for the sake of reward, and do not long for inaction. Instead, perform work as a person established within yourself- without selfish attachments, alike in success and defeat (2:48). Work for the sake of work alone. “The wise unify their consciousness and abandon attachment to the fruits of action, which binds a person to continual rebirth. Thus they attain a state beyond all evil” (2:51). The unwise are those who are motivated by the desire for the fruits of action; they are miserable because they are always anxious about the results of what they do. Anxiety will fade away when consciousness is unified. There will be no cause for worry, whether things go well or ill.
Mastery of the Senses. Returning to the chariot metaphor, the horses that pull the chariot are the five senses, which are controlled by the mind. Krishna teaches Arjuna that the wise can draw in their senses at will, just like the tortoise draws in its limbs. When we abstain from sense pleasures, we will still crave them for a while. But in time these cravings disappear when we see the highest goal. The truly wise are those who subdue their senses and keep their minds absorbed in the Self. Krishna says, “use all your power to free the senses from attachment and aversion alike, and live in the full wisdom of the Self. Such a sage awakes to light in the night of all creatures. That which the world calls day is the night of ignorance to the wise” ( 2:68-69). The Bhagavad Gita is a powerful and eloquent book that everyone should read, regardless of their faith or spirituality. The four points given here are not all the Gita teaches, they come from the second chapter, which is kind of an overview of the entire book. This article is meant to introduce the Gita and it’s message. As such, it is just a reflection of original; the real thing is much more beautiful. Reading the Bhagavad Gita will broaden your knowledge of the Hindu religion and deepen your understanding of the Self within. I found this sermon to be both “enlightening” and “intriguing”. My interest has been sparked to pursue further study of the Hindu Faith. Thank you, I enjoyed joked reading. The kingdom of God is within. Excellent sermon, and just what I needed right now. Thank you.